I have a revelation yesterday. It's been four and a half years since we lost Faith. I haven't been able to really open up about her until now. I have rarely talked about her or what happened. I didn't know if anyone still cared; I didn't want to make people uncomfortable, and frankly, it was still just too hard. God has really been working on my heart this summer. I thought that I had come to acceptance a long time ago, but I don't know that I really did until recently. I feel like I am finally bearing fruit--seeing how God has worked through our tragedy and continues to be who He says He is. This brings me to my revelation. 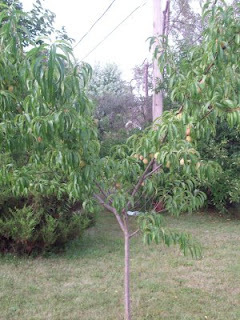 My parents bought me a peach tree to plant in Faith's memory. 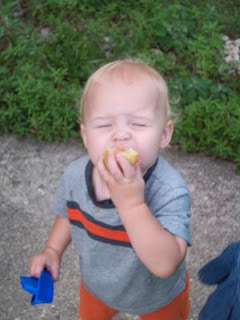 Every year the birds and squirrels pick the peaches by June--while they're the size of a walnut. I've always been disappointed and have just assumed that it will never bear fruit. This is the first year that the peaches have stayed on. I'm not trying to be philosophical but I don't think it's a coincidence that Faith's tree bears fruit the same summer that I have. John 15:8 "This is to my Father's glory, that you bear much fruit, showing yourselves to be my disciples." Now that is awesome! I love how our faith can show "fruition" in real evidence like that.